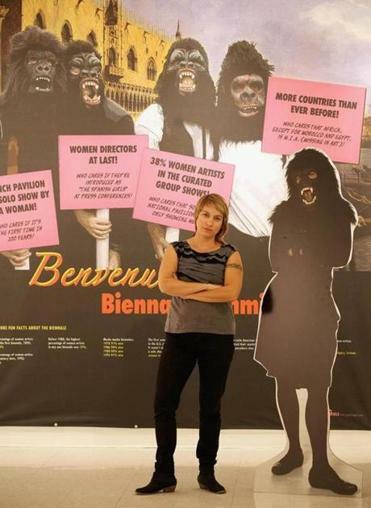 Above: Montserrat’s Leonie Bradbury with Guerrilla Girls signage. BEVERLY — The art world keeps inviting the Guerrilla Girls in, which puts the undercover artist activist group in a strange position. It’s hard to be incendiary, let alone provocative, when the institutions you critique are welcoming your work. Still, “Not Ready to Make Nice, Guerrilla Girls in the Art World and Beyond,” now up at Montserrat College of Art, startles with both humor and facts. That’s what has made the Guerrilla Girls so effective since they began their campaign to expose art world sexism and racism back in 1985, making anonymous appearances in gorilla masks and posting fliers on New York streets, tallying women represented in museums and galleries there. The group is still actively counting — for this show, its members paid a visit to the Museum of Fine Arts and estimated that just 11 percent of artists in the museum’s collection are women. 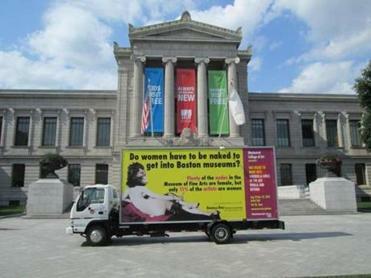 Unlike in the 1980s, though, the MFA was in on the action. Institutional navel-gazing has been trendy in museums for years, perhaps in part sparked by the Guerrilla Girls. Other trends in the last 25 years include a flood of multicultural exhibits in the 1990s, and more attention to women artists in contemporary venues. The Montserrat show, organized by Columbia College Chicago and pared down a bit to fit the gallery, focuses mostly on what the Guerrilla Girls have been up to in the past decade. It features a handful of billboards and other signage, a participatory wall to scrawl on with the heading “I’m not a feminist, but. . .” and, for history’s sake, a re-creation of some of the group’s original fliers plastered on a wall. In 2005, the Venice Biennale invited the group to assess that event. A billboard in “Not Ready to Make Nice” shows the artists in snarling gorilla masks holding signs along a canal, such as one that reads, “French Pavilion has solo show by a woman! Who cares if it’s the first time in 100 years!” Still, the group dubbed it the “first feminist biennial,” because the directors were women and the percentage of exhibiting women artists was relatively high — though still not half. The feminist group has a show at Montserrat College of Art. Another billboard, made at the invitation of the Millennium Court Arts Centre in Northern Ireland in 2009 and depicting a pint of stout, reads “Let’s toast Irish art, lads! (Pssst: Not so fast, lasses! ).” One toast, “May your art schools be harems,” lists statistics of enrollment (overwhelmingly female) and department heads (overwhelmingly male) in Irish art schools. In 2008, working with a young performance art/activist group, the Brainstormers, they staged an action that included a fake protest by the concocted group MAN (Male Art Now), outraged that they hadn’t been included in feminist art shows. Some of that signage is on view here. It’s all very cheeky, which makes the work palatable despite the hard facts it sometimes conveys. Hannah Verlin's installations in Montserrat's 301 Gallery elegantly strive to make the intangible tangible. For "Communion," Verlin has impressed the names and dates from markers in the old burial ground in Harvard Square into edible paper, hung on pins on the wall. The names are vaporous, hard to read. I hesitated to take one and eat it, which the artist encourages. I felt I was somehow forming a relationship with the long-departed whose name I ingested. For "Stars, Exoplanets, and Terrestrial Planets," Verlin has written the names of stars in a minuscule hand in white on black paper. The idea is that the names are as imperceptible as the stars themselves, although you can read them with a magnifying glass, just as you can see the stars with a telescope. Does either make them any more real? She takes a similar tack with "Birth, Death," in which she transcribes Boston's vital records from 1630 to 1730, with births going up one column and deaths going down another along the floor, making a nearly illegible, beautifully textured river of life. We can count and measure and record, but do those enable us to grasp the distance between earth and a particular star, or the substance of lives lived here centuries ago? We can't understand, but there's a felt quality to that lack, a sense of both absence and presence, implying our tiny size in the scope of things, which Verlin evokes. Julee Holcombe has three sets of intricate photographic digital collages at Gallery Kayafas. One is a set of portraits and allegories that are a tad precious, too packed with symbols, stiff and portentous. But her landscapes and cityscapes are terrific. For “Babel Revisited,” she used scores of images, mostly from her own photographs — to create a monolith of a gleaming city built upon rubble. 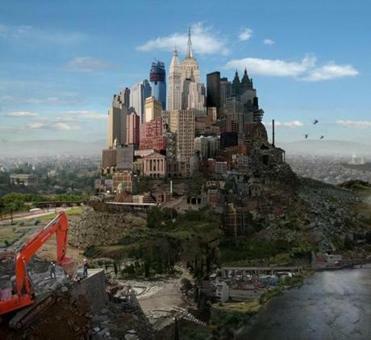 It's a sci-fi scene with resonances in present and past, deftly balancing progress with decay. One group, called "Chimerica" to blend China and America, is in a scroll format, which leads the eye up and down the way an Asian landscape painting does. "Merchant in a Shaded Dwelling" shows a demolition site at the bottom, with children playing over a hole in the earth, and a man selling watches, while a waterfall flows above. There’s threat here, and commerce, and nature's beauty, and the combination is deliciously unnerving.